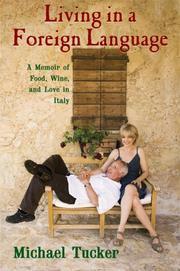 Devoted foodie Tucker (I Never Forget a Meal, 1996) and wife Jill Eikenberry, both veteran actors familiar for their stints on L.A. Law and elsewhere, find a second home in the heart of the Italian peninsula. Near Monteluco in Umbria, a stone cottage called Rustico was comfortably settling deep into its fourth century when the couple first saw it. They traveled there several times in one year to partake in the Umbrian way of life, then bought Rustico, sold their West Coast place and established transatlantic housekeeping in New York and central Italy, whose culture they enjoyed sharing with friends and family. After remodeling their 13th marital residence (doubling its size with an addition that matched its stone walls and brick tile floors), they purchased furnishings and contemplated acting opportunities when not rusticating. There was much partying with colorful new friends and dear old ones, but the principal pleasures at Rustico were founded on the Italian genius for food. Tucker recalls shopping for truffles and pasta, the joy of home cooking and the hunt for authentic eateries. He extols the local tartufo, grappa and pork. He describes visits to butchers and building fires at home for suckling pigs and marinara pizzas, fondly detailing all the preparations. His delight in performing as chef is evident, as is his affection for his wife, family and friends, as well as for a favored district in the middle of Italy. Not at all the usual actor’s memoir, but a simple toast to eating, drinking and innocent merriment in old Umbria.